Spirits were high at Tullamore Show on Sunday last as a crowd of more than 60,000 people flocked to the Butterfield Estate to enjoy Ireland’s biggest one-day agricultural show. We captures the positive atmosphere with our new ‘Live Life Love Farming’ initiative which saw farmers from all over Ireland revealing what they love most about the farming lifestyle. 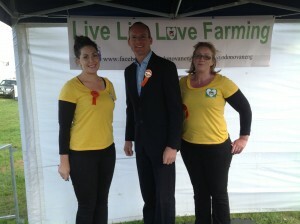 The ‘Live Life Love Farming’ event was launched at the show by Minister Simon Coveney. Deirdre O’ Donovan who was at the show enjoyed meeting the farmers; “Farmers sharing their love of what they do is truly inspirational. We will continue with this venture right through until the National Ploughing Championships in September where we will be showcasing the most inspiring and motivating insights that the farming community of Ireland have given us into their lives. Both Mairead McGuinness and Minister Coveney, who were on our stand at Tullamore, reiterated that this has been a particularly tough year for farmers so we are delighted to be able to stand with the farmers of Ireland and look forward with a positive mindset and hope that next year we will see a change for the better”. 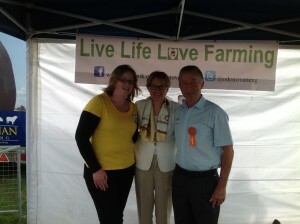 Speaking to farmers at the launch of ‘Live Life Love Farming’ at Tullamore Show Deirdre O’ Donovan found that every farmer has a story to tell. “Many of the farmers I spoke to found it refreshing to remind themselves what it is about their profession that they love. Farming is one of the toughest careers to be in so it was fantastic to get positive feedback from farmers and the best part was the craic and the stories that came about as a result of the ‘Live Life Love Farming’ launch”. We want you to share what you love about the farming lifestyle. Simply take a photo and post it to out wall on facebook outlining what you love most about the farming lifestyle. 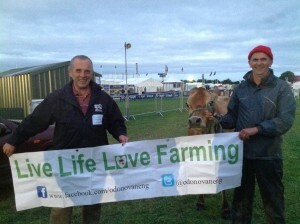 To get involved in ‘Live Life Love Farming’ visit the our Facebook page www.facebook.com/odonovaneng or call 021 7334066.